The Orchard Room team believes that children need to feel secure in order to thrive and invests considerable time and energy in this key area. A key carer is allocated to each child when he/ she starts in the Orchard Room. The key carer builds a close relationship with the child and his/her family. In the Orchard Room we focus on each child as an individual and plan our day around the children’s needs. We take into account parents’ information and use this to help us meet children’s needs. Routines that have been established at home for sleeping, resting, eating and changing/ potty training will be continued wherever possible. 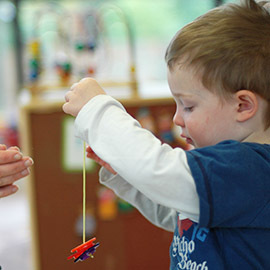 Key carers make on-going observations of the children and record his/her special interests, achievements and difficulties in all areas of development. Working with parents and ‘really knowing children’ forms the basis from which we plan. Planning is based on the Early Years Foundation Stage Framework, published by the Department for Education. The team ensures that all areas are delivered through planned, purposeful play with a balance of adult-led and child-initiated activities. Key carers are paired with co-carers. 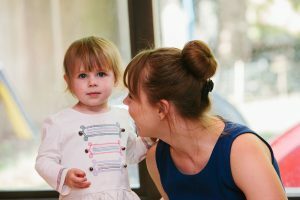 Co-carers provide additional support for groups of key children and will typically work on the opposite shift to the key carers to ensure continuous, personalised care all day.